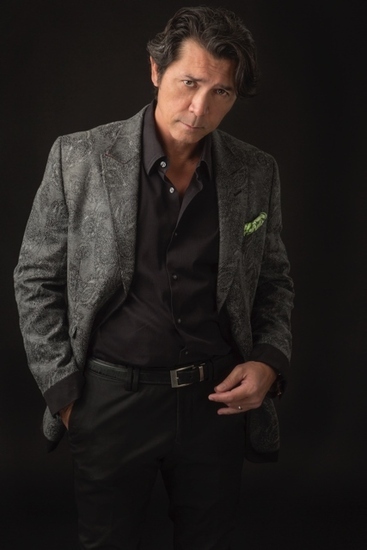 PT: So here we are in bed with Lou Diamond Phillips and Richard Zavaglia — oops! maybe that doesn’t sound so good! LDP: (Laughing) No, that’s okay! I do have an image to maintain. RZ: Actually, I slept with the director, producer, actor…that’s how I got the job! PT: (Laughing) We thank you both so much for granting us this interview — and to have it sitting on a major prop from the play, too — the bed actually fits in with our Pillow Talking motif. Of course, as you know, we had the opportunity to see the play and LOVED it! Can you tell us how you came up with the idea? LDP: Well, I had a bad break-up a number of years ago and that led me to thinking about relationships and the things that can happen. Relationships are supposed to be about love and then they get all messed up. So I got this idea that the devil must be at least fifty percent responsible for love. PT: That’s so true! So tell us, Richard, how did you get involved? RZ: Lou and I came together in LA when I was the co-artistic director with Dan Luria at the Playwrights’ Kitchen Ensemble. That was a non-profit organization funded by, Showtime, DeeGee Entertainment, and The Steve Tisch Foundation. We had a writing series where we would get stars to read a play on stage at the Coronet Theatre in LA. We did Burning Desire as a benefit for Aids Pediatric. We had Lou, Brooke Shields, and Noah Wyle play the characters and Swoosie Kurtz read the narration. PT: Wow! What a great cast! PT: That’s so awesome. When was that? RZ: 1996 or 1997. I left LA in 2001 and moved to Texas. I got cast as an actor in the play A Few Good Men. Lou came in to play the Jack Nicholson part. LDP: (doing a great Jack Nicholson) And I actually didn’t do the part sounding like this! RZ: We reconnected. I asked if anything ever happened with his play. He said run with it see what you can do. He left after A Few Good Men closed and joined the cast of the national tour of Camelot. I moved to Florida about the same time. As it so happened, Camelot toured Florida where we were living. My wife and I went to see Lou, of course. I tried to get Burning Desire produced in Florida, but couldn’t do it. So I decided to come back to New York City after a twenty-eight year absence primarily to see if I could get the play produced. We had an incredibly successful reading at St Malachy’s actors’ chapel on 49th St.
PT: And now you’re at the Seven Angels Theatre — lot of Bible references. Was it fate? RZ: I think so. 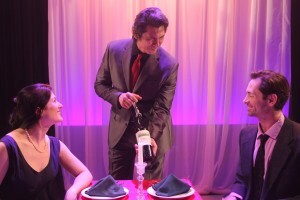 I subsequently got cast in my old friend Dan Lauria’s play, Dinner with the Boys, at New Jersey Rep in Long Branch. 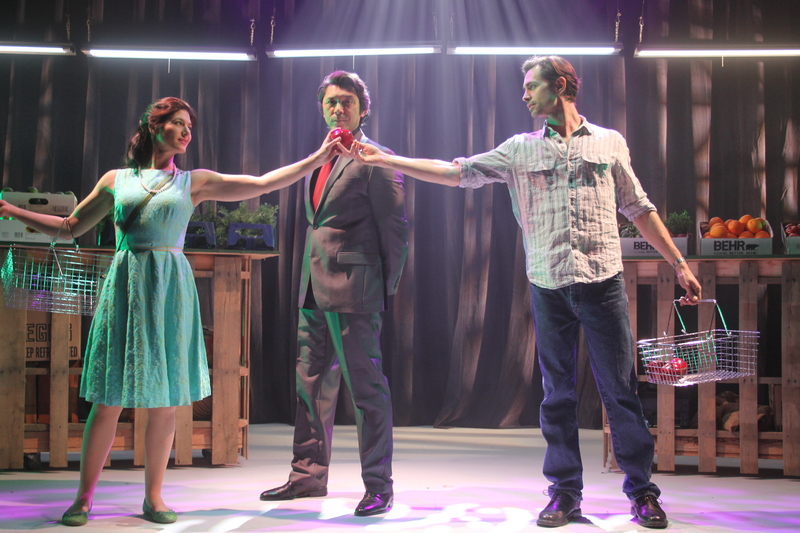 The play was a hit and we moved to Off-Broadway at the Acorn Theatre on Theatre Row. Semina De Laurentis, the Artistic Director of Seven Angels Theatre went to college with Dan. We actually had sent the play to her after we did the LA reading. She loved it, but lost her funding and couldn’t do it then. She came to see Dan. We chat after the show. I tell her I’m producing Lou’s play. The rest is history. PT: Sounds like fate to us! The Devil is in the details. Lou, there are other plays that use the Faust theme, like Damn Yankees. 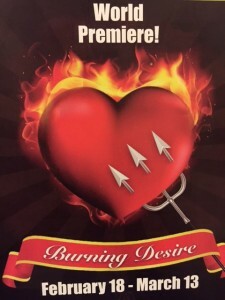 But what’s so unique about Burning Desire is that you are so damn likeable as the Devil! LDP: Thank you! I thought it was important to have the Devil be likeable. After all, Lucifer was the brightest angel in Heaven and he does tempt people and make them do things, so he should be charming. PT: How true! We see a lot of psychology in Burning Desire and other themes like the differences between men and women. Did you research that or intend for that? And also, tell us about your writing process. LDP: I consider myself to be very well read and I’ve included that and my other experiences in my writing. I basically had written the opening monologue and put it away. Then I came up with the ending. But it was in a drawer for a while. Eventually I finished it while I was riding back and forth on the train to Long Island. PT: Well, it definitely worked! Then you were able to get it here! LDP: And it was pretty wild, too. In the lobby here at Seven Angels there is the Devil’s Corner bar — we thought they did that for us, right, Richie? PT: All the devil and angel references! So, Lou, we’ve seen you in so many dramatic pieces like La Bamba, Young Guns, Stand and Deliver, Longmire. Seeing you in this was real treat — we didn’t know you were such a funny guy! LDP: Thank you! I really love it. I did a lot of comedy when I started out. It’s nice to get back to my roots. RZ: A lot of people don’t realize Lou can do comedy. This is a star vehicle for Lou, obviously, but I am certain a lot of other actors would jump at doing this part. PT: It’s such a great part! Tell us what attracts you to doing theatre? LDP: I’ve always loved doing live theatre. There’s that sensation of immediacy for an actor. I studied drama in college. But I’ll tell you, when we first started rehearsals for Burning Desire and I did the opening monologue (which is VERY long) I was like, who wrote this? (Laughing) But it is a lot of things that I believe. PT: Yes, it is long and you were amazing. So as for other theatre, we know you also received a Tony nomination for The King And I.
LDP: Yes. I just love playing The King and I. Of living actors I have the longest record playing in The King And I — something around 600+ performances. Of course, Yul Bryner played it 4625 times. RZ: Lou is a trained stage actor. That’s where it all starts for a true actor. That’s why Al Pacino, Denzel Washington, Bradley Cooper all go back to it. It is so gratifying for an actor to be in front of a live audience. PT: Lou, we love how you break the fourth wall and play directly to the audience. It is almost like a Las Vegas act. LDP: Yes! And funny story — one night there was a priest in the front row and I thought, should I play to him? Of course I did! I kept checking back to see if he was laughing. And he was laughing so everything turned out okay! PT: Your fellow actors in the play are wonderful. Tell us about the audition process. RZ: The auditions were held in NYC and it was intense. We had over 500 actors. We saw “Evans” one day and “Andrews” the next day. Then we had call backs for both parts. We narrowed it down and brought in eight couples for Lou to see and choose. We mixed and matched them. They were all brilliant. We made our choice and ended up with our great actors here. It took the time and explained to the finalists that these decisions are highly subjective and didn’t reflect on their talent. LDP: And that just shows you what kind of guy Richard is! 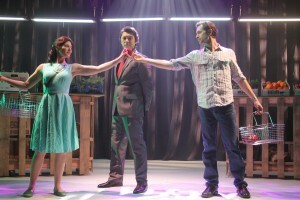 PT: Tara Franklin as Evan and Ryan Wesley Gilreath as Andrew are wonderful. The Devil’s Minions are great, too. How did those parts come about — we read that they weren’t in the initial scrips? RZ: The dancers came about as a result of a phone conversation I had with Lou when I was living in Florida. I thought this could be a Vegas Show and Lou said he always thought it could use some [eye candy]. When we met with Semina in NY, we mentioned adding two dancers. It was a decision I thought could move the story forward, help with set changes and be part of the main action. It works, so we intend to keep the Minions in future productions. LDP: Sophie [Lee Morris] and Jackie [Aitkin] are great. They have everything. They can act and dance. 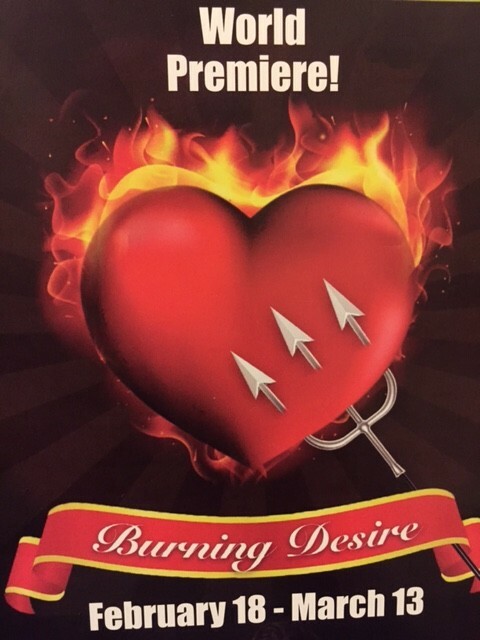 PT: So where is the future of Burning Desire heading? RZ: We want to take it to New York. I have believed in the play for a long time. I had a very good friend of mine whose opinion I respect. He is a published playwright and makes a living as a writer. His plays are performed all over the world. He saw the reading we did at St. Malachy’s and the show here. He said this play could run for five years on Broadway. It has all the elements to be a hit. And audiences love Lou! PT: And so do we! We know you have been playing to sold-out crowds and standing ovations here. RZ: Yes! People have a great time in the theatre. Burning Desire entertains and enlightens It has a message without being preachy. It’s a star vehicle and when Lou leaves, any number of other stars would want to play it.